Sandals - like going barefoot with no pain! 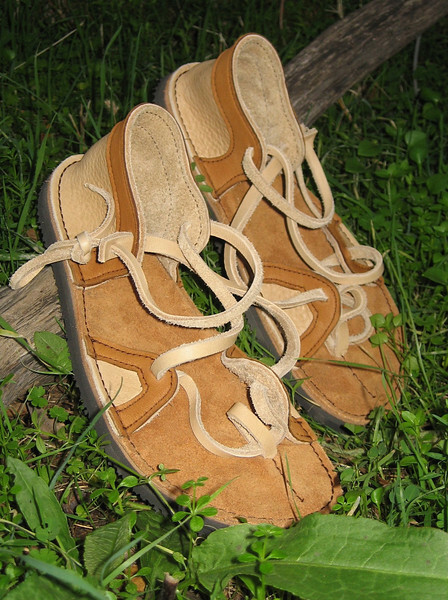 Custom made sandals come in a variety of styles- 2 Tab, 4 Tab, and Closed Toe Sandals. The sandals are extra special because you can truly go anywhere in them. Okay maybe not everywhere, but almost! You can swim, dance, garden, hike, go out to dinner, work, play.... you get it! The toe thong story - I never wore a shoe that had a toe thong. Even at camp as a child, I couldn't stand the 'shower shoes', because they went between your toes. This toe thong is different. Really. When I do a sandal fitting, I mark the furthest back spot between your big toe and your second toe, then when making your sandals, I place the toe thong 1/4" forward from that mark. The way the sandals fit, the toe thong is just an anchor for the lacing, and prevents your foot from going forward over the front. Really. Pretty soon you don't even feel the toe thong. No kidding. I actually threw out my Birkenstocks when I finally consented to try wearing this style. And, no more stink foot! Yeh! The leather doesn't hold bacteria like the synthetic footbeds do. AND THEY ARE WASHABLE!! REALLY! THROW THEM IN THE WASHER - SCRUB THEM IN THE SINK - WEAR THEM IN THE SHOWER - DANCE ALL DAY - WEAR THEM SWIMMING - REALLY! And then there is the Closed Toe Sandal. Super comfy. I stand all day, my feet happy on the foam footbed with my arch support correctly placed. Same heel as the open sandals, but with a covered front. And yes, I make pointy shoes for those of you who have that desire.